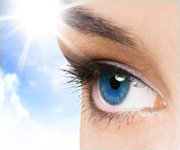 If you have glaucoma or elevated intraocular pressure, do you believe it is "in your genes?" If you believe glaucoma is entirely genetic, do you also believe you are stuck with glaucoma the rest of your life? The orthodox view is that glaucoma has a large genetic component and that if you develop glaucoma you did so because you have genes that caused the disease to occur. Under this view the treatment options are usually limited to either surgery or a lifelong regimen of glaucoma medications or both. These treatments are meant to manage the condition under the assumption that there is nothing short of gene therapy (which may or may not be available in the future) that would actually cure glaucoma. I would like to encourage you to read The Genie in Your Genes: Epigenetic Medicine and the New Biology of Intention by Dawson Church. This book is on my FitEyes.com Book Club list of highly recommended books. You will get a wealth of ideas from this book that can be applied to managing your intraocular pressure. I have already been using many of the alternative medicine approaches mentioned in this book and my experience indicates that it is possible to achieve excellent results lowering intraocular pressure with this approach. Furthermore, as you will understand after you read the book, there is reason to believe that we can, through the simple lifestyle changes I discuss on FitEyes.com, turn off the genes that are responsible for health conditions such as elevated intraocular pressure and glaucoma. Everyone I know personally who has glaucoma and who has the ability to accurately measure their eye pressure via self-tonometry has found that there are certain lifestyle factors that affect their eye pressure. That is a significant finding by itself. Most ophthalmologists are not yet aware of the fact that we can have such a large positive impact on our eye pressure through simple lifestyle changes. However, according to the new research emerging from the science of epigenetics, the potential benefit of these lifestyle changes may go well beyond simply serving as an adjunct to existing medical treatments. It is proven that we do have the ability to alter the expression of our genes -- to turn off certain genes. Moreover, those (epigenetic) changes we make can be passed on via inheritance to our children! Many of us with glaucoma have already had all the children we plan to have, but this finding from the field of epigenetics serves to underscore the power of lifestyle changes to fundamentally address health issues at the deepest levels of our physical makeup. Did you realize that even though there is currently no such thing as gene therapy for glaucoma, you can already do things that affect your physiology at the level of your genes? This is a very new finding. Consciousness-based medical treatments have a power to heal that few of us realize today. If you read Dawson Church's The Genie in Your Genes: Epigenetic Medicine and the New Biology of Intention you may begin to see that the non-medical and alternative glaucoma treatments we discuss on FitEyes.com in a new light. You will learn about some of the leading edge research coming from epigenetic medicine and how this ties in to our state of consciousness. I have found that my state of consciousness is the single most powerful factor affecting my intraocular pressure. The challenge I face is in communicating to FitEyes.com readers what I mean by state of consciousness. To do that, I will start by recommending another book: A New Earth: Awakening to Your Life's Purpose (Oprah's Book Club, Selection 61) by Eckhart Tolle. When you are able to be totally in the present moment without the ego dominating your mental functioning, as Eckhart describes, you will find yourself in a healing state of consciousness. When enough of us have that experience, I can take our discussion of states of consciousness to the next level. This is an exciting path. Did you know that all of the most powerful treatment options discussed in Dawson Church's book are consciousness-based too? This is the future of medicine and we can take full advantage of it right now.